Perfect for a living area or bedroom footstool or use as a decorative accent for any country kitchen or fireplace hearth. Charming Antique English Oak Foot Stool or Bench with Leather Upholstery~~c. 1920s. What is really interesting about this piece is that it has four ball and claw foot legs. The stool stands 19" tall with a 14" wide seat but adjusts all the way up to 24". 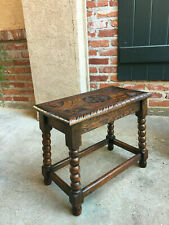 Petite Antique English Carved Oak Bench Stool Display Stand. carved “1897” on the top. ~One of several outstanding small carved oak antique benches/stools/tables from our last buying trip. It is SUCH a challenge to find the smaller accent pieces like this, we are very excited to have a selection of several! ~Fabulous French Louis XV style with cabriole legs and hand carved apron on all sides. ~Lovely French upholstery, with large brass tack trim~. NOT for like-new condition! ~One of several great antique stools and benches from our most recent container! ~BEAUTIFUL antique French bench seat with lovely carvings throughout and original cane seat and sides! 18.5” between cane sides;. NOT for like-new condition! flat seat top, approx. 20” x 16.5”. 14.5”height of seat;. Vintage French Half Moon Bobbin Leg Wooden Stool. In very good condition. Sturdy! Charming Antique English Oak Barley Twist Foot Stool, Bench or Settee~~c. 1930s. Perfect for a living area or bedroom footstool or use as a decorative accent for any country kitchen or fireplace hearth. Antique oak curved bussel bench with a pressed oak design that outlines the blue upholstered seat. A place where you can deal and be assured that there are NO REPRODUCTIONS! right away. ~~A wonderful antique English oak small square bench, vanity or foot stool with bobbin twist legs. Such a versatile decorator piece! Perfect stool or bench for a living area or at the foot of a bed. Vintage Antique Oak Stick & Ball Shelf Display stand. One ball is missing on bottom back side, also one stick (dowel) is broken below the ball on side of piece. A unique display piece, in very good condition. 69" wide x 11" deep x 16" tall. Good, solid and sturdy. This is a very clean sturdy quarter sawn oak piano stool. The beautiful back is supported with several turned spindles. The stool has decorative cast brass feet. Circa 1900. A place where you can deal and be assured that there are NO REPRODUCTIONS! This is a very clean sturdy oak piano stool. The back is supported with several turned spindles. Circa 1900. Needs tuned up on veneer on back. A place where you can deal and be assured that there are NO REPRODUCTIONS! Nice smaller sized French Renaissance Bench dating from the 1920's. Bench includes nice scrolled carvings with carved family crests. Bench includes underneath storage. Antique English Oak Stool, Bench or Foot Stool with Upholstered Cushion and Spindle Gallery~~c. 1930s. ~~Nice upholstered leaf or vine pattern cushion with shades of red, orange, gold, green and yellow with braid trim~~. ~Inset carved “linen fold” panels across the entire lower bench front and on both sides~. ~Large storage inside the bench~. This item is in good condition for its age, with normal signs of age and use, dings, scratches, and other imperfections. ~Heavily carved dark oak antique French pew or bench, stunning detail and superb quality! ~The detail is obvious, looks at the 3 back panels; the left has what is certainly a family shield with hearts on the upper and lower corners; the right panel also having a shield; GOTHIC TRACERY throughout~. An antique Cobblers Bench dating back to the 1860 era. Oak top with pine tool gallery and pine peg legs. Great bench to sit on or use as a coffee table. Note: Funds need to be cleared before item(s) are picked up. Item # 30247. A solid oak hall bench from the early 1900's has been newly upholstered. The Harp Gallery. Antique French Carved Oak Entry Hall Bench Gothic Chapel Pew Settle Trunk. ~One of a kind, either originally commissioned for a public chapel or personal chapel for an aristocrat~. ~Lower bench also has 4 similar carved panels, yet all have different designs; OUTSTANDING quality of these carvings! Signed Tonk. Item: Mission Oak Piano Bench. Mission Oak Design. We also provide a list of suggestions below to get your own quote. You are not purchasing a new piece of furniture so normal signs of wear should be expected. Beautiful & Well Carved Antique French Renaissance Bench. Bench is a long model with double lift up seats for underneath storage. Dates from 19th Century. Antique Victorian oak or elm painted stool with remains of very old paint in pink and green. There are remains of a Walt Disney transfer on one of the side supports. Sorry no cheques. Base 25 cms X 20 cms. 47-3/8" wide x 34-1/2" high x 23-3/4" deep. The seat is 17" from the floor and is factory slatted. This bench is clean, super durable & room ready. Charming Antique English Oak Rush Seat Foot Stool, Bench or Settee~~c. 1930s. Perfect for a living area or bedroom footstool or use as a decorative accent for any country kitchen or fireplace hearth. ~~Solid and sturdy oak~~. Antique French Gothic Bench dating from the 1920's. Bench includes underneath storage and a tall seat back with Gothic tracery carvings. Nice size. THIS ITEM IS IN OUR BELGIUM WAREHOUSE. STYLE: Mission. CONDITION REPORT : Clean Pre-Owned Condition. Antique Quarter Sawn Oak Piano Bench – original finish with four carved columns. The seat is hinged with storage inside. Circa 1900. A place where you can deal and be assured that there are NO REPRODUCTIONS! Antique 20s Machine Age Oak Industrial Ever-Hold Adjustable Desk Chair 17"-21"